Bates, R., Gill, T., Bicksler, A., Meitzner Yoder, L., Burnette, R., & Ricciardi, V. (2011, June) Designing strategies and systems to identify, preserve and promote underutilized indigenous crop species. 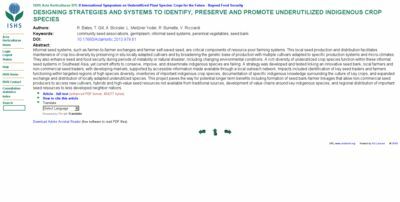 In II International Symposium on Underutilized Plant Species: Crops for the Future-Beyond Food Security 979 (pp. 569-576). Informal seed systems, such as farmer-to-farmer exchanges and farmer self-saved seed, are critical components of resource poor farming systems. This local seed production and distribution facilitates maintenance of crop bio-diversity by preserving in situ locally adapted cultivars and by broadening the genetic base of production with multiple cultivars adapted to specific production systems and micro-climates. They also enhance seed and food security during periods of instability or natural disaster, including changing environmental conditions. A rich diversity of underutilized crop species function within these informal seed systems in Southeast Asia, yet current efforts to conserve, improve, and disseminate indigenous species are failing. A strategy was developed and tested linking an innovative seed bank, local farmers and non-commercial seed traders, with developing markets, supported by accessible information made available through a local outreach network. Impacts included identification of key seed traders and farmers functioning within targeted regions of high species diversity, inventories of important indigenous crop species, documentation of specific indigenous knowledge surrounding the culture of key crops, and expanded exchange and distribution of locally adapted underutilized species. This project paves the way for potential longer term benefits including formation of seed bank-farmer linkages that allow non-commercial seed producers to access new cultivars, hybrids and high-value seed resources not available from traditional sources, development of value chains around key indigenous species, and regional distribution of important seed resources to less developed neighbor nations.